The expansion of transfers to families with children is at the centre of the policy debates in the US today. President Obama discussed these policies in major speeches and events, while candidates from both major parties advanced proposals in this regard in the 2016 presidential race. The main programme that provides childcare subsidies for low-income families in the US is the Child Care Development Fund (CCDF). The programme provides a subsidy of about 75% of childcare expenditures to low-income families. Another programme aimed at households with childcare expenditure is the Child and Dependent Care Tax Credit (CDCTC). The CDCTC is a non-refundable tax credit that allows working parents to deduct a fraction of their childcare expenses from their tax liabilities, at a rate declining with household income. Since the CDCTC is not refundable, only households with positive tax liabilities benefit from it. As a result, while the CCDF subsidises expenditures of poorer households, those at the bottom of income distribution do not receive anything from the CDCTC programme. In contrast, the Child Tax Credit (CTC) is a programme that provides households a partly refundable tax credit for each child, declining with income, independently of their childcare expenditures and the labour market status of parents. Since the CTC is not fully refundable, it does not provide benefits for poor households with zero or low tax liabilities. 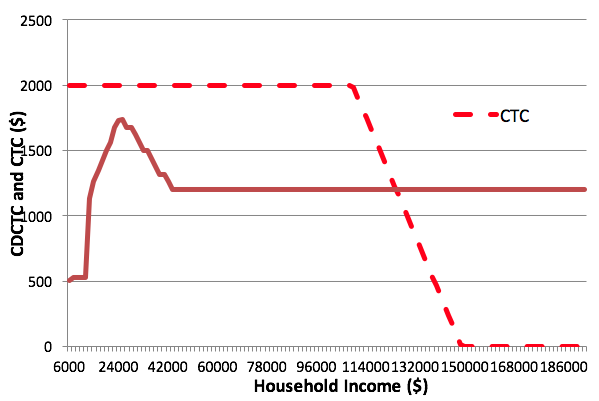 Figure 1 shows the potential tax credits that a household with two children receives from the CTC and the CDCTC as a function of household income. Note: The CTC and CDCTC are for a household with 2 children in 2005. The CDCTC schedule is calculated under the assumption that the wife earns 60% of the total household income and that the household spends 10% of its income on child care at each income level. Recent discussions have focused on making childcare subsidies more broadly available, on making transfers tax refundable, and on increasing their size (Burman et al. 2005, Maag 2015, White House 2015). Underlining the discussion is that other developed countries spend more on transfers to households with children. Several countries subsidise childcare provision in substantial ways. Sweden, for instance, devotes nearly 0.9% of aggregate output to this form of public assistance, while annual public expenditures per child in formal childcare amount to about US$ 6,000 (PPP) in 2008. Several authors have attributed the high levels of female labour supply in Scandinavia to the scope and magnitude of childcare subsidies there (e.g. Rogerson 2007). In contrast, childcare subsidies in the US are much smaller. The main childcare subsidy programme in the US, the CCDF, is minuscule in comparison. Overall, the US spends less than 0.1% of output in childcare subsidies, and subsidies per child in formal childcare amount to less than US$ 900 in 2011. Indirect childcare subsidies via the CDCTC programme are also small, with implicit expenditures of only about 0.02% of GDP. The size of the CTC programme is relatively larger, at 0.3% of GDP. Despite recent proposals and policy differences between the US and other rich countries, the consequences for the US economy of an expansion of current transfers to households with children are largely unexplored. We fill this void with a recent paper (Guner et al. 2017). We build an equilibrium life-cycle model with heterogeneous single and married individuals suitable for policy analysis. We build on recent work that studies the positive and normative aspects of effects of child care costs and subsidies (e.g. Attanasio et al. 2008, Bick 2016, Domeij and Klein 2013). Three key features distinguish our work. First, as in Guner et al. (2012), we allow for jointly determined labour-supply decisions of spouses at the extensive and intensive margins. Second, in line with data, we jointly account for the presence of children across married and single households, the timing of their arrival, and the associated childcare costs. In particular, we account jointly for the observed heterogeneity in terms of the number of children, childcare costs, and the availability of informal childcare. Finally, we model the dynamic costs and benefits of participation decisions by allowing female skills to depreciate due to childbearing disruptions. Hence, the expansions of transfer schemes that we consider capture potential increases in female skills, and corresponding effects on gender wage gaps. We parameterise our model in line with US data, and then evaluate large-scale, revenue-neutral expansions of the three programmes of transfers to households with children. We first make the CCDF programme at the current rate (75%) available to all households (universal). We then ask what would happen if the resources associated to the expansion of subsidies were spent on the expansion of a fully refundable CTC programme. 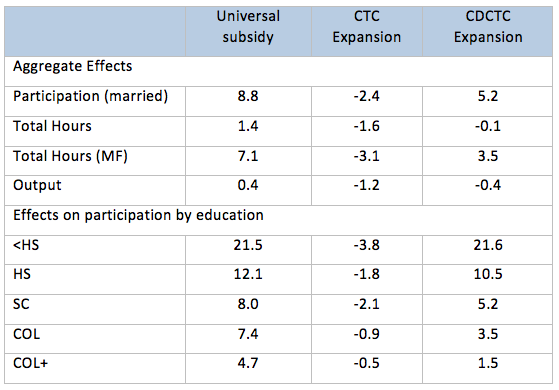 Expansions of childcare subsidies and the CTC are sharply different exercises: one provides childcare subsidies for all at a flat rate, while the other one provides transfers to all households with children that decline with income. Finally, we engineer an equivalent expansion of a fully refundable CDCTC programme that provides a mixture of childcare subsidies and transfers that decline with income. In contrast to a 75% universal subsidy, the subsidy rate declines with income, and can initially be higher than 100%, in which case a household receives a transfer beyond what they spend on childcare expenditure. 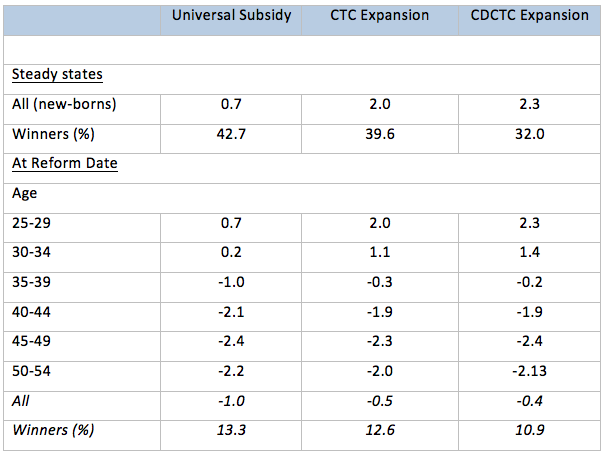 Hence, our experiments are equivalent to a universal subsidy and scale up the CDCTC and CTC schedules in Figure 1. They all require a 1.3% tax rate applied to all incomes. Universal subsidies lead to substantial effects on participation rates and labour supply. With universal subsidies, the participation rate of married females increases by 8.8% and aggregate hours by about 1.4% across steady states. The effects on participation are much higher for less-educated females. A universal 75% subsidy on childcare increases the participation rate of married females with less than a high school education by 21.5 %, while for those with more than a college education it amounts to 4.7%. Similar but more moderate effects emerge under an expansion of transfers to households under the CDCTC. The overall participation rate increases by 5.2%, and its change is also declining in educational attainment. Total hours of work remain essentially constant across steady states. Table 1 documents our results. In contrast, the expansion of the CTC leads to reductions in labour supply across the board. The participation rate of married females drops by 2.4%, and hours worked of all drop by 1.6%. As a result of all changes, output falls by 1.2%. Behind these effects is the nature of this programme, which is effectively a transfer to households with children without any work requirement. Thus, it produces an income effect on labour supply decisions that reduces hours of work. In perspective, the effects on the labour supply induced by a large-scale expansion of either childcare subsidies, or the CDCTC programme, are rather large. In related work (Guner et al. 2012), we found that fully replacing the income tax in the US by a proportional income tax – quite a drastic reform – leads to increases in participation rates of about 5.1%. This is less than 60% of the effects associated with the universalisation of childcare subsidies. To asses who wins, who loses and by how much, we compute the transitional dynamics between steady states implied by the policy change under consideration, when the policy change is unanticipated. Our notion of welfare is standard – we calculate consumption compensations, or the common percentage change in consumption in all future dates that leaves a household indifferent between the status quo and the new transitional path. Table 2 reports some of our findings. We find that the welfare gains for new-born households are substantial. This occurs under the expansion of all programmes. Taking into account transitions between steady states, welfare gains (consumption compensation) amount to 2.3%, 1.9%, and 0.7% under the expansions of the CDCTC, the CTC programmes, and the universalisation of childcare subsidies, respectively. Since the expansions are revenue neutral and designed to be comparable at a common tax rate, it is clear that the expansion of the CDCTC programme maximises welfare gains per dollar spent in transfers to households with children. Second, expansions of these programmes generate a diversity of welfare effects. In general, welfare gains are much larger for less-educated households. For new-born married households with less than a high school education, for example, gains amount to 4.4% (12.5%) under the CDCTC (CTC) expansion, while those with more than a college education experience losses under the CDCTC (CTC) expansion of -1.1% (-1.3%). Underlying these findings is the redistributive nature of the exercises we conduct. In other words, the CTC or CDCTC expansions disproportionately benefit poorer households, and/or childcare expenditures constitute a large burden for them. Finally, a central finding is the absence of majority support for the expansion of any programme at the date of their introduction. Indeed, for all the cases we analyse, we find that there is no majority support even among new-born households in the new steady state. Key for these findings is the simple fact that these transfers benefit relatively few households – young households with children who are not at the top of the skill distribution – and that their costs (additional taxes) have to be paid by all. Overall, these findings illustrate the need to understand, from a political-economy perspective, why child-related transfers emerge in modern economies. Attanasio, O, H Low, and V Sánchez Marcos (2008), "Explaining Changes in Female Labor Supply in a Life-Cycle Model," American Economic Review, 98 (4), 1517-42. Bick, A (2016), "The Quantitative Role of Child Care for Female Labor Force Participation and Fertility," Journal of the European Economic Association, 14 (3), 639-668. Burman, L E, E Maag, and J Rohaly (2005), "Tax Subsidies to Help Low-Income Families Pay for Child Care," Discussion Paper No. 23, The Urban-Brookings Tax Policy Center. Domeij, D, and P Klein (2013), "Should day care be subsidized?," Review of Economic Studies, 80 (2), 568-595. Guner, N, R Kaygusuz, and G Ventura (2012), "Taxation and Household Labor Supply," Review of Economic Studies, 79 (3), 1113-1149. Guner, N, R Kaygusuz, and G Ventura (2017), "Child-Related Transfers, Household Labour Supply and Welfare," CEPR Discussion Paper 11779. Maag, E (2015), "Reforming the Child Tax Credit," Urban Institute. Rogerson, R (2007), "Taxation and Market Work: is Scandinavia an Outlier? ", Economic Theory, 32 (1), 59-85. White House (2015), "Fact Sheet: Helping All Working Families with Young Children Afford Child Care," Press Release, 21 January.